It was raining yesterday, it’s raining today, and the sun isn’t going to peep out from the clouds tomorrow. Rainy days are rarely a pleasure and most of us usually hate this time. Rainy days urge people to sit around doing nothing with a terrible bad mood. Call it an autosuggestion or seasonal depression, many strive to see the sun when they feel down. However, you can pull yourself together and look at the situation from a positive perspective. Rainy weather gives us an infrequent opportunity to recharge, relax and slow down for a while. I have plenty of things put on the back burner and a rainy day is the best time to accomplish the most important tasks. Obviously, the tricks mentioned below are useful for any weather, but they may come in handy when you need to fake the mood on a rainy fall day. A rainy fall day is a great time to pamper yourself. This is especially a good way to enjoy a rainy day when you are alone. While dyeing your hair or getting a trim requires professional aestheticians and hairdressers only, other beauty treatments can be easily done at home. Moreover, at-home spa enables you to save lots of bucks. Indulge yourself with a fragrant hot bath. I always mix sea salt with a couple of drops of my favorite essential oils. When I want to relax I opt for vanilla or lavender scents. Now you can soak in the bath as long as you wish and get an aromatherapy at home. Then, exfoliate your skin and apply your favorite facial mask. Use natural ingredients and prepare your homemade beauty aids. Mani-pedi session will help complete the makeover. Frankly speaking, I don’t like cleaning. When rain pours, however, cleaning is a perfect way to stay active and productive. If you have kids, it’s even better. You can arrange a cleaning contest with them and find out who will cope with room cleaning first. Play some mood-boosting music, get equipped with an apron and rubber gloves and enjoy the cleaning session. Physical activity will increase the level of dopamine and boost your mood in a jiff. Moreover, it will help you burn those extra calories! Usually, sleepovers start with invitations, but rain is a thing you never expect. An impromptu bash can be even better, though. Prep a bottle of wine, order pizzas or make some light snacks. When the best friends gather together, they can find a countless number of things to do. Prank calls, dancing, playing board games, pillow fighting or a photo shoot are all great and fun ways to spend a rainy night with your best friends. Spend the whole day with your friends or family in the kitchen baking something tasty and healthy. If you have time, opt for something more unusual and complicated. Try to bake a rainbow layer cake or multicolored macaroons, for example. If you cook alone, use this time to practice a new cake recipe you’ve found for Christmas or your niece’s birthday. Cookery isn’t my cup of tea, but I like to do it with my family and friends. A rainy evening is a good time to watch your favorite movies. My personal list of movies-to-watch will hit 50 soon! But I work hard and I have really very little time to enjoy a good movie at night. However, when it’s raining outside, I watch a few classy romantic movies like The Notebook, Once, The Lake House and The Eternal Light of a Spotless Mind. You can opt for cheerful cartoons or bone-chilling thrillers as well. Stock up on paper tissues, get a big cup of hot chocolate and some treats, curl up under the warm blankets and start your movie marathon. Need to clean out your wardrobe? Rainy fall day is a great opportunity to decide what to throw away, donate, sell or keep in your closet. If you think you have nothing to put on every time you open your closet, it’s not the reason to go shopping. Organize your closet and you will find many beautiful and new things you can wear daily. Examine the clothes for any kind of damages like stains, missing buttons or broken zippers and answer honestly whether you are going to put it on again. If you feel diffident or uncomfortable when you wear a certain piece of clothing, throw it away. Ask your friends to help you or consider hosting a clothing swap party. Once in a while I find cold rainy days utterly inspiring and creative. Even though I’m always running out of time, I try to do crafting regularly. If you are stuck at home, why not use this time for DIY projects and arts and crafts? I bet your Pintrest board is overwhelmed with craft ideas that you want to try. Start learning something you’ve always wanted to experience- be it knitting or origami. Sure, you might not create a masterpiece at first, but you will get a good experience and have lots of fun. While most people find it reckless, I swear it’s one of the most amazing feelings in the world when you spend the whole day walking in the rain. All you need is your earphones, raincoat, boots, and a solid umbrella. A stroll followed by a hot bath and a cup of flavored coffee can burst the feeling of happiness and felicity. Workouts or playing any sport with your friends outside or taking a walk in the nearest park is also a fantastic option. When I was a little girl, one of my favorite activities to do on a rainy fall day was to settle down with a good adventure book and sip a hot tea with cookies. I’m not a child anymore, but a good book on a cold night is still exactly what I need. 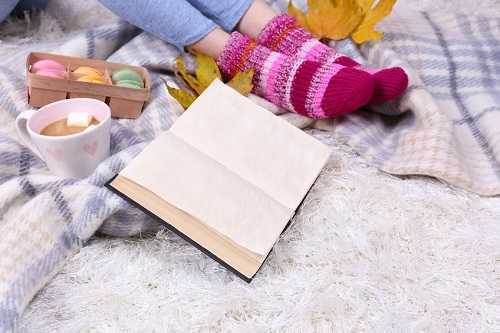 If you have nothing to do on a rainy evening, grab your favorite book and a cup of your favorite hot chocolate or tea. Not only will it entertain you, but it will also help you fall asleep faster. While an autumn book should be a bit mystic and melancholic, any book will actually go. Prep a cozy corner with a heap of pillows and wool blankets and light candles for a more relaxed atmosphere. Now you are ready to dive into another reality and forget about your problems and the weather outside. Being alone on a rainy fall evening is a time to reconsider a lot of things in your life. Fall is recognized as the best time to start changing life. While most people find fall melancholic and depressive, I love this season for the outburst of inspiration and vital energy. I will always associate fall with the beginning of a new school year that is the beginning of a new stage in my life. Rainy fall days are the best days to focus on my goals, career and plans. If you have no idea how to start, take a notebook, settle in an armchair and take a deep breath. Answer a few essential questions like ‘Am I happy with the job I’m doing?’ or ‘If I had enough money what I would do.’ This will help you to understand your basic desires and needs. Who knows, maybe this rainy fall day is going to be a turning point in your life. Just because the weather isn’t great doesn’t mean your day is ruined. Spending a rainy fall day at home can also be fun and useful. These are only a few ideas on how to spend a good evening at home. If you have any other ideas, share them with us, please.